Having hiked interest rates four times in 2018, the Federal Reserve has adopted a more dovish position since the start of 2019. Fed Chair Jerome Powell has talked about 'cross-currents and conflicting signals' making policy outlook more uncertain. Recent data has been somewhat mixed, so with inflation described as 'muted' the central bank can be 'patient' with regards to the timing of when to react with any policy change. We would expect all of these words and phrases to get a mention in either the press release or the accompanying press conference on Wednesday. The only substantive change is likely to be a more cautious set of forecasts for the Fed funds target range. Rather than signalling two rate rises this year and one in 2020, we think they will opt for just one hike in 2019 with one more in 2020. There are certainly reasons for being less optimistic about the US economy in 2019 than in 2018. Higher interest rates and the strong dollar will act as a brake on growth while the support from last year’s fiscal stimulus will fade. Then there is weaker growth from China and Europe at a time of lingering trade tensions plus a recent batch of weaker domestic US data, coupled with the prolonged government shutdown. Given all of this, there are clear reasons to be cautious, but we think futures markets are being too pessimistic in pricing in the next Federal Reserve move being an interest rate cut. After all, Jerome Powell continues to suggest economic fundamentals are 'strong' and the economic outlook is 'favourable'. Moreover, there is evidence data is starting to improve again. The rebound in equities and rising worker pay has seen consumer confidence return to its cycle highs. The combination of positive sentiment and falling mortgage borrowing costs is also contributing to a recovery in mortgage approvals for home purchases which may lead to a rebound in home sales. Retail sales started 2019 in decent shape, durable goods orders have rebounded, and the ISM surveys remain consistent with healthy economic growth. Trade remains critical to the outlook though. If US-China and US-EU tensions can be resolved in a way that limits barriers, and we suspect they can, this will remove a dark cloud hanging over the global economy. In turn, this would give businesses more clarity and confidence to put money to work and lead to a broader, more upbeat assessment of the economy. Unfortunately, the February payrolls number was a major disappointment, rising only 20,000 on the month, but we don’t believe this figure tells the true story, much like the 311,000 gain in January was likely a major overstatement of reality. Take an average of the first two months of the year and 165,000 for both would seem much more realistic. The demand for labour remains strong, but finding the right people with the right skill sets is the challenge. Both the Federal Reserve’s Beige Book and the National Federation of Independent businesses report that the competition for workers is bidding up both pay and non-wage benefits. Lower than expected inflation readings have hurt the argument for another rate rise. But we continue to believe inflation will be pushed higher by rising corporate costs – most notably the cost of labour. 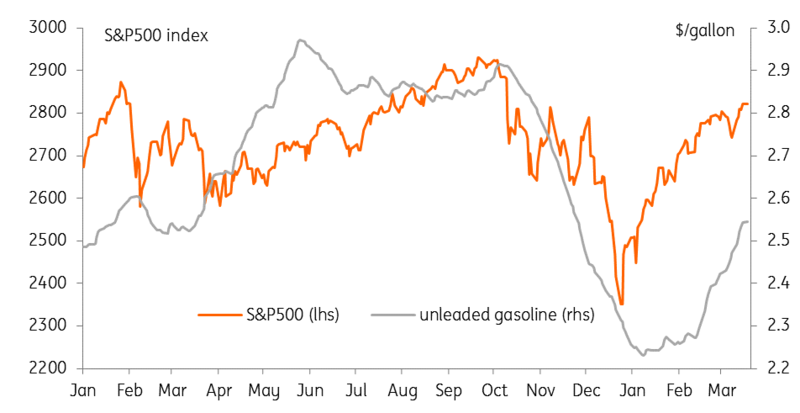 Gasoline prices are also rebounding, which will feed through into higher transportation fares and distribution costs. We continue to look for core inflation to rise above 2.5% in the summer. So if we are right and trade tensions do ease, the growth backdrop recovers from transitory weakness and inflation grinds higher on the back of a strong jobs market, we believe the argument for additional policy tightening will grow. Consequently, we continue to look for a rate rise in September despite the futures market pricing a rate cut in 2020. 'Cross-currents' have led the Federal Reserve to adopt a more 'patient', data dependent approach to monetary policy for 2019. While the market is pricing in an eventual cut as the next Fed move, we continue to look for one last 25 basis point hike in late summer as growth returns and trade tensions ease. After having expanded the Federal Reserve’s balance sheet to a peak of around $4.5trillion through quantitative easing, it is gradually being unwound through the proceeds of some maturing assets not being reinvested in the bond market. The balance sheet currently stands at just under $4trillion with the Fed signalling that it may bring this process of balance sheet reduction (or quantitative tightening) to an end as early as the end of this year. We could see this being formally announced on Wednesday and it would leave the Federal Reserve with a much larger balance sheet than was originally envisaged at the start of the process. We have to remember that some officials (including former Fed Chair Ben Bernanke) argued the US could 'grow into' a larger Federal Reserve balance sheet. Indeed, he stated back in 2017 that 'there are reasonable arguments for keeping the Fed’s balance sheet large indefinitely, including improving the transmission of monetary policy to money markets, increasing the supply of safe short-term assets available to market participants, and improving the central bank’s ability to provide liquidity during a crisis.' It may well be that technical factors are driving this change of stance from Fed officials, but we are keen to see a detailed explanation for why they might be bringing it to an end and what size a “neutral” balance sheet is. The direct market implication is that if the Fed is not going to run down the size of its balance sheet much more then, there will be fewer treasuries for the bond market to absorb at a time of rising Federal government deficits and rising Treasury issuance. On its own, this implies reduced upward pressure on Treasury yields than if the Fed had decided to reduce the balance sheet to pre-crisis levels.